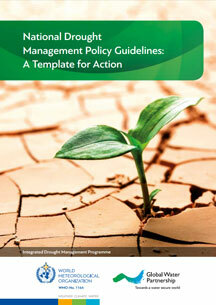 WMO/GWP Integrated Drought Management Programme (IDMP) (2014) National Drought Management Policy Guidelines – A Template for Action (D.A. Wilhite). Tools and Guidelines Series 1. WMO, Geneva, Switzerland and GWP, Stockholm, Sweden. The National Drought Management Policy Guidelines provide a template for action that countries can use in the development of a national drought management policy and drought preparedness/mitigation plans. The process is structured in 10 steps that can be adapted by countries to reflect their institutional, infrastructure, legal, socio-economic and environmental context. It includes case studies from Brazil, Mexico, Morocco and the USA and will be continuously updated based on the experiences gained in the guidelines’ application. The guidelines respond to a need for action oriented drought policies, which Governments articulated at the High-Level Meeting on National Drought Policies.